Achingly real. Deeply Affecting. Emotionally Turbulent. the enduring hope of maybe someday. Another unforgettable experience from Colleen Hoover. And this story is living proof. I use the author’s own words to describe my own experience. How is it possible to make simple words incite so much emotion? Make me feel so much? Within the span of these 320 pages, I felt betrayal. Anger. Hope. Confusion. Desire. Love. I was moved to tears. And at times, I was honestly scared. Colleen Hoover puts us in some uncomfortable spots, making me uncertain on how I would feel in the end. Would I be happy? Was there a true right and wrong? Does that even exist when love fuels the choices we make? The pages of this story were brimming with feeling… often times stirring up a fury of emotion that crushed me and antagonized me, while at the same time thrilled me with the reverie of the kind of love that consumes… that finally breathes relief upon meeting its soul mate. And in addition to a beautifully crafted narrative, its power is intensified with the richness of another dimension. The story roared to life through the voice of Griffin Peterson. I felt every word. Every moment. And if it weren’t already certain, Colleen Hoover has once again proven herself to be a master storyteller, weaving a story with words that are deceptively simple and characters that are nothing less than unforgettable. Sydney Blake is content. She’s got a great boyfriend, a great roommate, a great job and a growing love of music. Despite some disappointing parents and a pestering hesitation at taking her relationship to the next level, life is good. In addition, she’s found some unexpected joy listening to a talented and mysterious neighbor who plays his guitar each night. Sounds curling across the courtyard to ignite her passion. Melodies to inspire her. Lyrics unleashed to paper. But everything falls apart on her twenty-second birthday when she realizes her boyfriend and best friend are having an affair. Luckily fate intervenes and she finds herself thrust closer to her captivating neighbor. Heartbroken and homeless, Sydney finds comfort in her time with Ridge, all the while learning the depth of his talents despite some irremediable impediments. When Ridge makes a hard-to-refuse proposition, they begin to write music together. Her words, his melody, side by side, night by night as their lives begin to entwine. Each set of lyrics becoming more personal as a connection between them forms, grows and intensifies… pulling them together. Closer. I really loved both of them individually. One of the aspects I love most about this author’s characters is that they always have such big, altruistic hearts. Sydney is so selfless and good. She’s witty and talented and before too long, she finds herself falling for Ridge. Ridge is incredibly talented. He’s a survivor… a surprisingly good and healthy outcome of a childhood marred by ugliness, alcoholism and hate. He’s loyal to a fault with an unfailing drive to protect others. With Sydney, however, he finds a very real connection, an ease, a magic… an intense need to be with her. There are truths, however, circumstances that cannot be denied that push them apart. For the good of others, they must squash, bury and forget their feelings for each other. And as a reader, my heart broke for the rightness of their togetherness, but I simultaneously felt conflicted by the goodness of their intentions given the impossible situation. In my opening thoughts, I said that the story was emotionally turbulent and what I meant by that is that I felt so many feelings at war within me as the scenes unfurled on the pages. As they both battle their emotions, the power to deny them becomes impossible and the so-called lines they drawn blur as their actions become instinctive…a need for relief more powerful than their good intentions. The story, which is told through an alternating Ridge and Sydney point-of-view does an amazing job at helping us to understand their thoughts and feelings, deepening the connection I had with them as characters, so when reality brutally severs hope, I was shattered. As the story comes to its natural climax I honestly thought… heck, here it is… one of my favorite authors may finally falter. The looming end seemed too murky and unresolved. But it’s her adept skill at taking us to uncomfortable places, having us wallow in the throes of uncertainty, then somehow ordering things in a way where the impossible becomes possible and the unrightable finally feels right, well it makes the payoff all the sweeter, all the more powerful. This book was just beautiful and real and everything I hope to experience upon the first flip of any story’s page. Furthermore, the added richness of the music made it all feel so alive. Special. Intimate. I love the fact that this author continues to push herself in each of her books. That even at the top of her game, I continue to see growth and innovation with each new release. Whether it be a novel way to format chapters to maximize impact or in this case, adding an unexpected dimension to heighten emotion, Colleen Hoover has simply become one of the most exciting authors to read. I anxiously await her next book, Ugly Love later this year. I’m nearly finished reading MAYBE SOMEDAY right now (about 85% done), and it has been one of the most emotional books I’ve ever read. The response it has elicited in me was so surprising. Such an impactful and amazing book. I loved this book – it’s my book clubs choice for next month too and I’m going ALL OUT on the event! I’d love to enter the contest, but it says it hasn’t started yet – do we know when it will be open? Thanks so much!!! It’s not until I finish a book that I think “Damn, I wish I could read that again for the first time”. I haven’t read this one yet, but I know once I do, I’ll be so incredibly jealous of those who will be experiencing it for the first time. Fantastic review and I am so beyond thrilled to experience this for the first time VERY SOON! Hi, do you have an email SignUp?? I absolutely love your blog. Geez!! I got goosebumps reading your review! Amazing! Thanks for sharing your thoughts and making me all the more anxious to read this book!!!! This is a WONDERFUL giveaway…thanks so much for the chance!! 🙂 Good luck to everyone!! Amazing review! I love CoHo’s books…all of them! 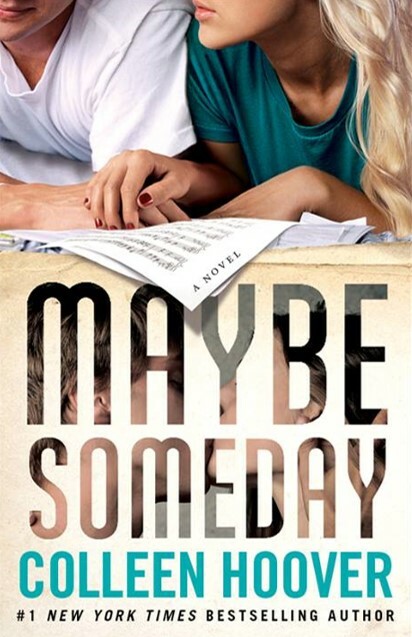 I can’t wait to read Maybe Someday! Please choose me. My daughter and I are fans and we would love autograph copies of your books. Great review! Awesome giveaway! Love to win this!! Thanks!